Background - Many organisms such as plants can be characterized as complex-shaped branching forms. The morphological quantification of the forms is a support for a number of areas such as the effects of environmental factors and species discrimination. To date, there is no software package suitable for our dataset representing the forms. We therefore formulate methods for extracting morphological measurements from images of the forms. Results - As a case study we analyze two-dimensional images of samples from four groups belonging to three species of thalloid liverworts, genus Riccardia. The images are pre-processed and converted into binary images, then skeletonized to obtain a skeleton image, in which features such as junctions and terminals are detected. Morphological measurements known to characterize and discriminate the species in the samples such as junction thickness, branch thickness, terminal thickness, branch length, branch angle, and terminal spacing are then quantified. The measurements are used to distinguish among the four groups of Riccardia and also between the two groups of Riccardia amazonica collected in different locations, Africa and South America. Canonical discriminant analysis results show that those measurements are able to discriminate among the four groups. Additionally, it is able to discriminate R. amazonica collected in Africa from those collected in South America. 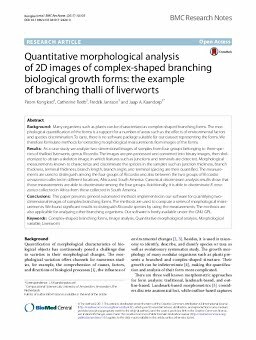 Conclusions - This paper presents general automated methods implemented in our software for quantifying two-dimensional images of complex branching forms. The methods are used to compute a series of morphological measurements. We found significant results to distinguish Riccardia species by using the measurements. The methods are also applicable for analyzing other branching organisms. Our software is freely available under the GNU GPL.